The universe works in mysterious ways; something that the latest NASA discovery attests to. Astronomers at the space agency have spotted strange patterns of what seem to be dark dunes on the Martian surface. Interestingly, these patterns bear uncanny resemblance to the dots and dashes of Morse code. 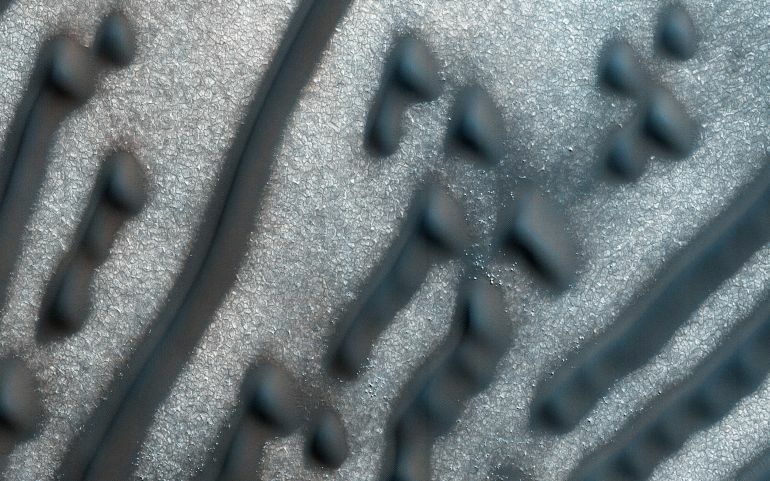 Although not the first time that such patterns have been captured in photo, the unique topography of this particular Martian dune field has allowed researchers to interpret the message for the first time. Located south of the Red Planet’s north pole, the dunes are believed to have been naturally formed. Sorry, if you were hoping for some kind of extraterrestrial involvement. These dunes show the bizarre patterns in striking detail, which could be because they were formed inside a naturally-occurring depression with limited amount of loose sand. As the scientists point out, the dots and dashes were likely the result of strong winds blowing over the Martian surface. The dashes, for instance, were created by bi-directional winds travelling at nearly right angles to the dark dunes. The dots, according to the researchers, are known as “barchanoid dunes”. These structures are quite mysterious, with the scientific world still unsure as how they are actually formed. Some geophysicists are of the opinion that the Martian dots are produced when something comes in the way of the winds forming linear dunes. NASA, however, is not convinced.